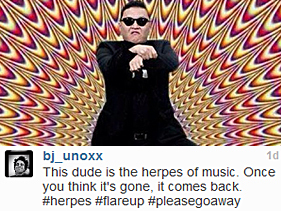 Earlier this week, Green Day frontman Billie Joe Armstrong dismissedPsy as "the herpes of music," adding that, much like viral disease, "once you think it's gone, it comes back." Armstrong was, of course, noting the success of Psy's "Gentleman," the follow-up to his massive "Gangnam Style," though, as you can probably tell, he was none too happy that the South-Korean Sensation has escaped one-hit wonder status (and just in case it wasn't obvious, BJA added a couple of hashtags — #flareup and #pleasegoaway — just to get his point across). And now, Psy has responded to those jabs ... sort of. In a new interview with Fuse, he thanked Armstrong for the words, though it bears mention that he probably didn't understand what they meant. "What is herpes? Is it like a disease?" Psy asked, before being supplied with the grisly details. "I kind of like it, it's cool. I should say something to him. He's saying I'm like herpes, [I] keep coming back ... I think it's really cool, and I appreciate that. Thank you." For the record, Psy just thanked Armstrong for comparing him to this, maybe because he's been called worse: Just last month, during a stop in the MTV Newsroom, he described himself as "an a--hole", and summed up his role in the "Gentleman" video as "stupid." So far there's been no response from Armstrong ... seems he's too busy hanging out with the Rolling Stones, another group that knows a thing or two about repeated cycles of activity and remission.